My warrior daughter Edie entered the world on July 30, 2016 with eyes wide open ready to soak it all in and leave behind her indelible mark. From early on, we knew we had our hands full. 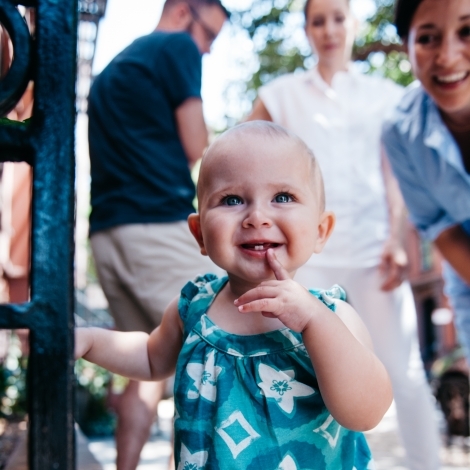 Our first months as new parents were filled with the usual sleepless nights and anxiety, but Edie had a special way of keeping us on our toes. Our wide-eyed beauty did not take kindly to naps or bedtime, fighting vigorously to have her way, but we soon realized this was Edie’s world and we were just living in it. If you knew Edie, she was the queen of the castle, driven by a bubbly yet commanding personality. She used her endearing personality and whole body smile to win over people and always be the center of attention. Trips to the grocery store or a restaurant quickly became the “Edie Show.” She used her gorgeous blue eyes and infectious smile as she flirted with everyone she came in contact with, jumping from one person to the next until she had a captive audience. After 14 months of travel, laughter, and exhaustion chasing after our effervescent daughter, our whole world changed in October 2017. Four days prior Edie hit her head, as toddlers often do, but the bump was so large and so pronounced we took her to the ER. With no signs of neurological damage, we were observed for several hours and sent home. A fever of 102 and vomiting presented the next day and the day after that Edie stopped walking, stopped talking and stopped eating and then we noticed her belly had grown slightly distended. We returned to her pediatrician who wisely told us to go straight to the ER. Soon after arriving, we quickly realized our daughter was not suffering from a virus, but something much scarier. We were told her platelet count was dangerously low at 17 (normal is above 150), she had a brain bleed from her bump and low platelets, a 5cm mass near her kidneys along with lesions in her liver and spleen. Given her rapidly deteriorating health, chemotherapy was started with the hopes of improving her status in the near term until a diagnosis could be determined. Finally, a diagnosis was made after two weeks; she had a rare and obscure type of leukemia called acute megakaryoblastic leukemia (AMKL). The first question that you want to know but dread to ask, is what are her chances of survival? However, you quickly realize that it doesn’t matter and you just want to be on the right side of the statistic. The sobering truth is that pediatric AML only has a 50% survival rate, and sadly, with Edie’s AMKL it is closer to 20% with little known about the specific cellular mutations. And in 40 years there has been little to no advancement in the treatment of AML, until last year when with the help of people like you and LLS 4 new drug treatments were approved with more research projects presently being supported by LLS. Edie held on in the stubborn way she had always lived to make sure mommy and daddy had a plan on how we would get through her passing. So, on Friday night, April 6, at 8pm we read books, said prayers and cuddled her between us and spoke of all of the things we loved about her and our commitment to her legacy, which include 1) our commitment to Eleanor, 2) our commitment to helping others dealing with pediatric cancer and working toward a cure and 3) our commitment to each other as husband and wife. As a mother you must grieve for the lost moments, the lost hugs, the lost kisses and the lost cuddles. You begin to grieve even before your child takes their last breath as day by day they transition further away. This journey and our promise to Edie is to help find a cure. It’s the role that we will play to enable us to be the mom and dad we want to be to Edie, even though it is not how we imagined these roles would be. Through this commitment and Edie’s influence, we have been able to raise over $143,000 for LLS in nine weeks for Team In Training this year, proving Edie is directing others and making a powerful impact. This fundraising also allows us to give back to an organization that leapt to support us in the beginning of our cancer journey. Whether your raising money through a happy hour or running in a race, your participation and commitment gives this grieving mother hope that the vision of a cure is possible and that one day the heartache I feel, does not have to be felt by another.